Kolkata: Not everyday does one get to see a young pacer from Bengal terrorising batsman in their crease and knocking them off with bouncers. Ishan Porel is one such player who has ventured into this rare territory. 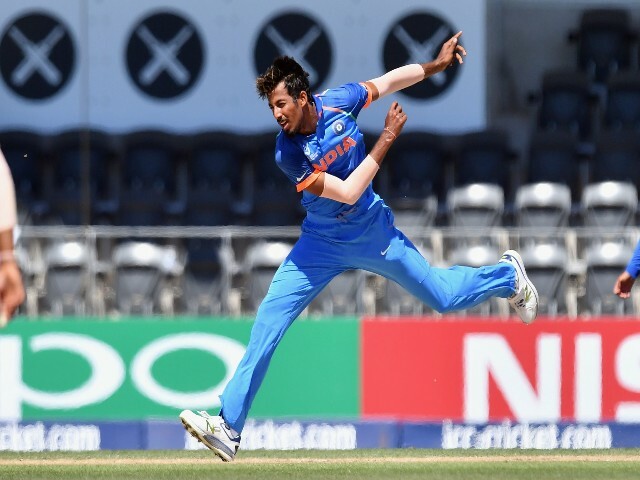 After missing most of the 2018 U-19 World Cup matches due to the injury he sustained in the opening match against Australia, the 19 year-old from Bali burst into the scene with a match winning figure of 4/17 in six overs against Pakistan in the semi-finals helping India reach the final for a record six times. While many see Porel as one of the many bright futures for India, former India captain and President of the Cricket Association of Bengal (CAB) Sourav Ganguly feels that “the U-19 World Cup is just a stepping stone” and that Ishan “has to bridge the gap between U-19 and senior level” if he has to make it big in the international circuit. “He is a (CAB’s) vision 2020 product. The Cooch Behar trophy U-19 which we won, he had a huge role to play. He (Porel) and Kanishk Seth did well. We will help him go in the right direction,” said Ganguly at the launch of 20th edition of the Cricket Year Book. The Indian colts under the tutelage of Rahul Dravid (coach of U-19 team) has been breathing fire, racing to the finals with a thumping 203 runs victory over arch-rivals Pakistan. The boys in blue remain the only side still undefeated in the World Cup and take on Australia in the finals on Saturday. They had defeated the Kangaroos earlier in the opening group encounter. “India will win the U-19 World Cup” said the former southpaw in a confident tone. “Indian cricket system is so good that the structure has been made and without structure you cannot produce cricketers. These players are products of Indian cricket structure. In the next five years, Indian cricket, save Australia and England, will be the best in the world,”said Ganguly. Besides beating Pakistan, India also thrashed minnows Papua New Guinea and Zimbabwe by 10 wickets and also thumped neighbours Bangladesh in the quarter-finals by 113 runs. “They won convincingly in every game. They beat Australia by more than 100 runs and hope they do it in the final also,” he added. Courtesy, their impressive performance in the ongoing World Cup, few stars from the Indian U-19 team has also fetched big contracts in the Indian Premier League (IPL) auctions and while the icon agreed that “Shubman Gill, (Kamlesh) Nagarkoti, (Shivam) Mavi, Ishan Porel are exceptional talent,” he also felt that one should never judge a player by the extravagant prices they fetch in the auctions. “Don’t judge players by the amount of money they get in the IPL,” added Ganguly. “Hashim Amla went unsold and he has 54 international centuries while Ishan Kishen gets over Rs 6 crore having played only Ranji Trophy. Moreover Jaydev Unadkat is the highest paid Indian player. He has played two ODI’s,” he elaborated. “The IPL has no rationale, it is a different format and you have to look at it that way. It is about demand and supply and can’t be a yardstick to determine a player’s value,” added the CAB President when asked as to why India’s current best wicketkeeper Wriddhiman Saha went for just 5 crore, while Dinesh Karthik fetched a whopping 7.4 crore rupees from the Kolkata Knight Riders, one of Ganguly’s former IPL teaams.